I had a few people mention Mintwood Place in Adams Morgan as a place I needed to try, so on Tuesday I made that happen. First off, I loved the menu. Great nibbles (smaller appetizers), regular appetizers, entrees, and drinks. My biggest problem was narrowing down what I could realistically consume in one sitting. 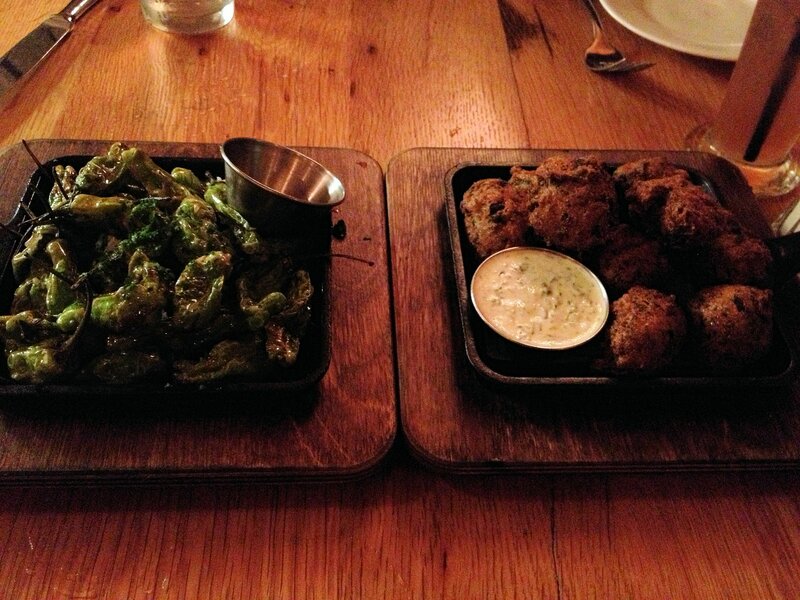 The shishito peppers and and escargot hush puppies. I kept things at two nibbles (blistered shishito peppers and escargot hush puppies), and two appetizers (steak tartare with spuds and goat cheese and beet mountain pie) to start off. All were good…the peppers were subtle (although I found the provided hush puppies sauce also went well with them), and the other dishes were quite flavorful and creative. 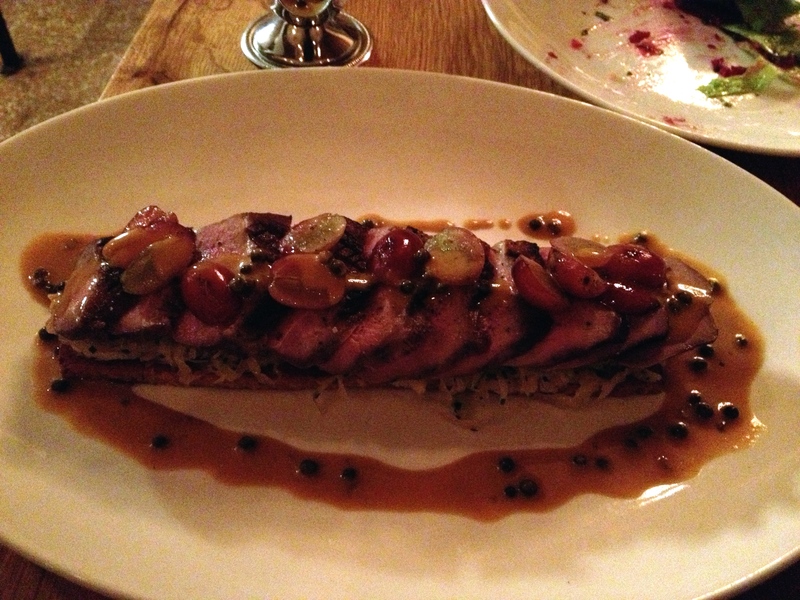 The duck breast “au poivre” with minute sauerkraut, which I ordered for my entree, was excellent. Well-prepared duck paired well with the pepper sauce and bed of sauerkraut. Duck “au poivre” with minute sauerkraut. Good desserts – a classic brownie sundae (with a super-moist brownie) topped with sprinkles, and a Baked Alaska flambé closed out the evening. 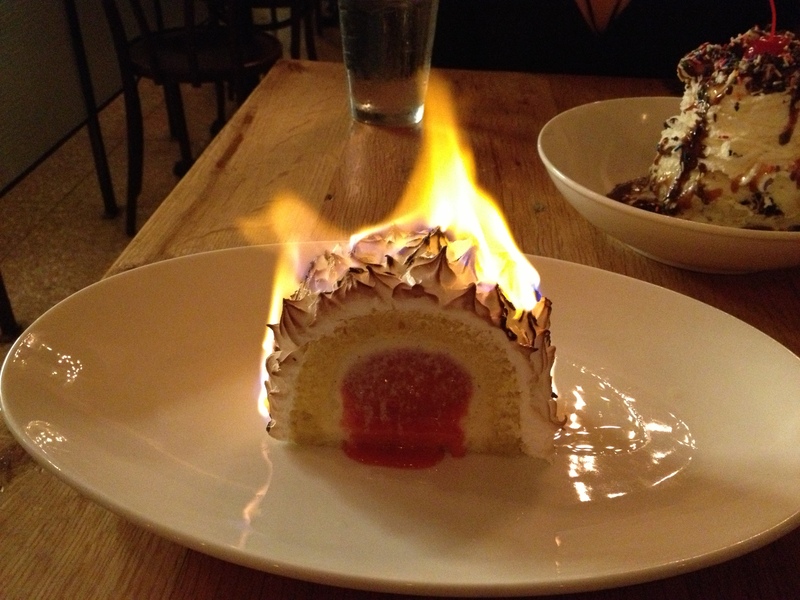 Oh look, my dessert is on fire. The cocktail menu is also very creative. The Smokin’ on the Bayou (Benevá Mezcal Añjeo, Grapefruit Juice, Jack Rudy Tonic Syrup, Bitter Truth Creole Bitters) and Woodrow Wilson (Boomsma Genever “Gin”, Hum Liquor, Elderflower, Cava) were two that I tried out. The former had a subtle, smokey flavor that I’d credit to the mezcal, while the latter had a slight all-spiciness…I’m guessing that came from the Hum, which I’m not familiar with, and bills itself as a botanical spirit with a number of different ingredients. The Smokin’ on the Bayou cocktail. This particular dinner was pricy – besides the above, there was one additional entree and two additional cocktails – for a total of over $200 with tip. However, you’re getting what you pay for…everything was of excellent quality, and the tastes involved were exceptional. For some other reviews on Mintwood Place, check out Tom Sietsema’s at Washington Post (3 of 4 stars), and this one from Been There, Eaten That. Having enjoyed RJ Cooper’s Rogue 24 a couple times in the past, I wanted to try Vidalia, where Cooper had been chef de cuisine from 2004 to 2010. The chef and owner of Vidalia, Jeffrey Buben, is himself a James Beard Foundation award-winner, so I went into this dinner with high expectations. Here’s some details and recommendations (spoiler: everything I ordered was excellent). 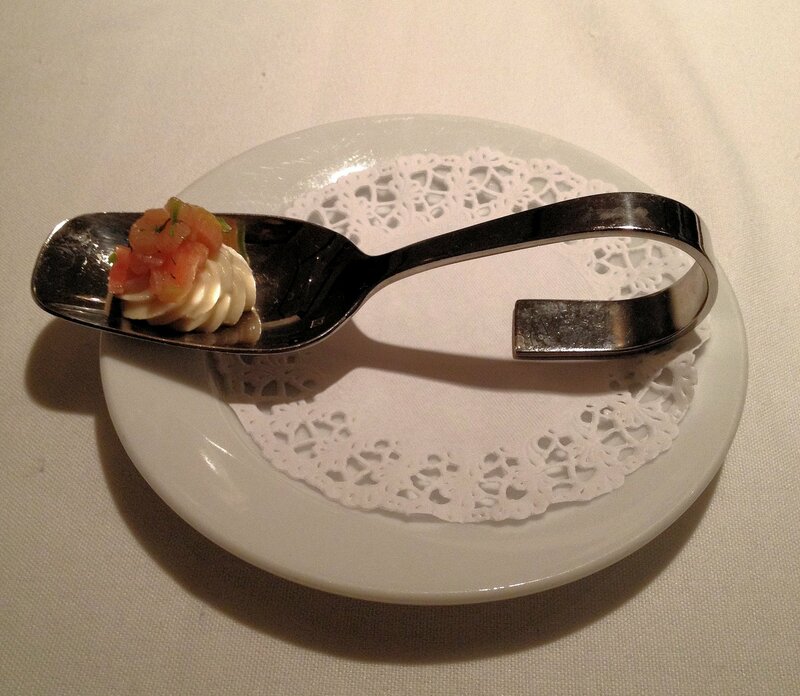 When an amuse-bouche is good, you get excited for the rest of the meal. This one was rhubarb and orange on a parsnip purée. Seared Hudson Valley Foie Gras – “Rhubarb, spicy peanut praline, black pepper biscuit, cheerwine gelée.” I love foie gras…if it’s on the menu I almost always get it. This version didn’t let me down. 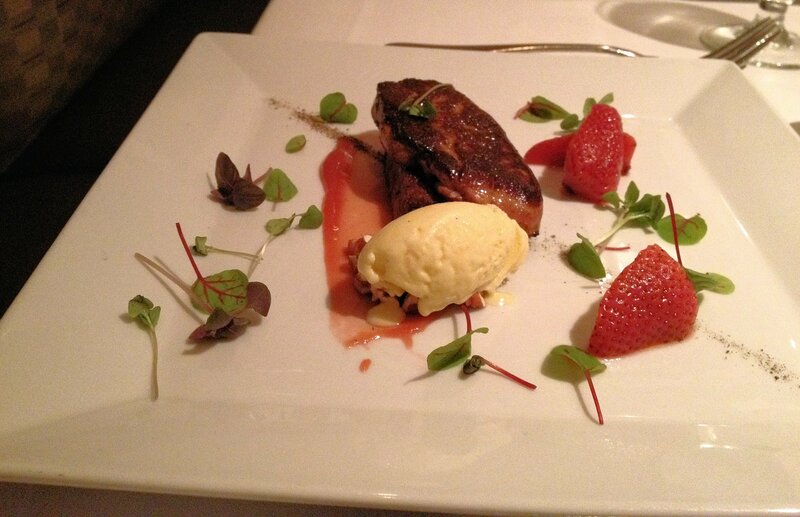 The savoriness of the foie gras went so well with the sweetness of the fruits and nuttiness of the praline. Cheerwine is a cherry soda from North Carolina that has been around since 1917. Great cherry flavor – reminds me of cherry pie. Buy it online or at some grocery stores and restaurants. 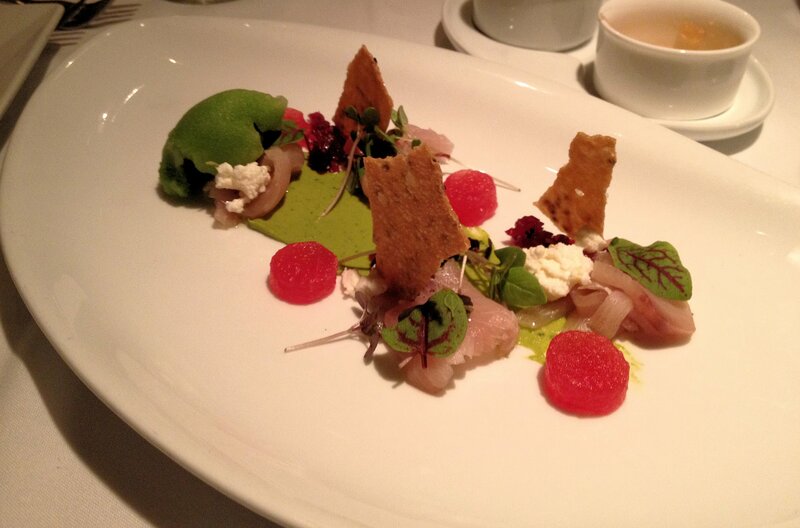 Hamachi Crudo – Another good one…this was on the chef’s inspirations special menu. Came with chilled watermelon, cranberry purée, cheese, and a vegetable sorbet. The hamachi itself was fresh and tasty, without the fishiness you sometimes get with lower quality or poorly prepared yellowtail. Crisp Berkshire Pork Trotter – “Sunny-side egg, black pepper grits, apple butter, béarnaise sauce.” The pork trotter was by far my favorite appetizer….absolutely delicious. So many flavors that work together in harmony. This is no pickled pig’s foot, but rather some nice and tender leg meat. 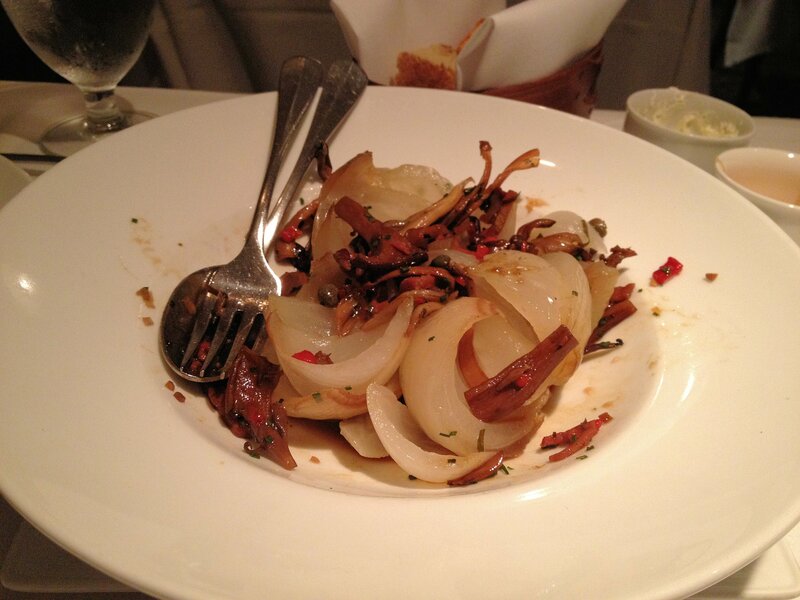 If you only get one appetizer at Vidalia, this is the one you should be getting. 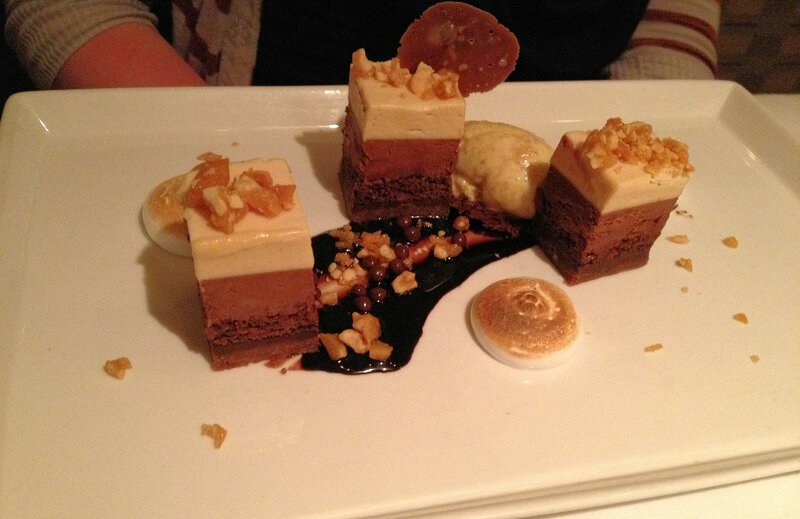 It was difficult to settle on only three firsts…many of them sounded great from the menu descriptions. Next time I want to try the Oyster Pan Roast and the Sweetbreads & Waffles (right behind another dish of the pork trotter). 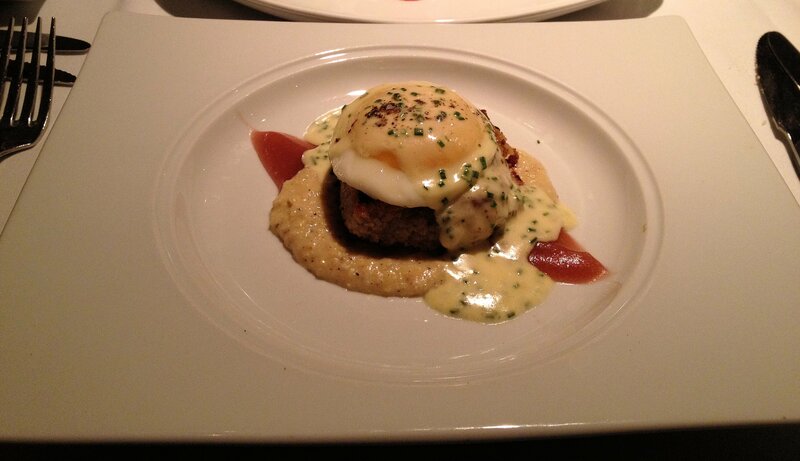 Pork, egg, béarnaise, apple butter, grits, pepper…so many flavors working so well together. This pork trotter was excellent. Great foie gras. I’d get this one again. Tasty hamachi dish…hit my fish fix. Spiced Crusted Duck Breast – “Duck confit beignet, carrot purée, english peas, pearl onions, rhubarb, lavender jus.” Duck two ways. 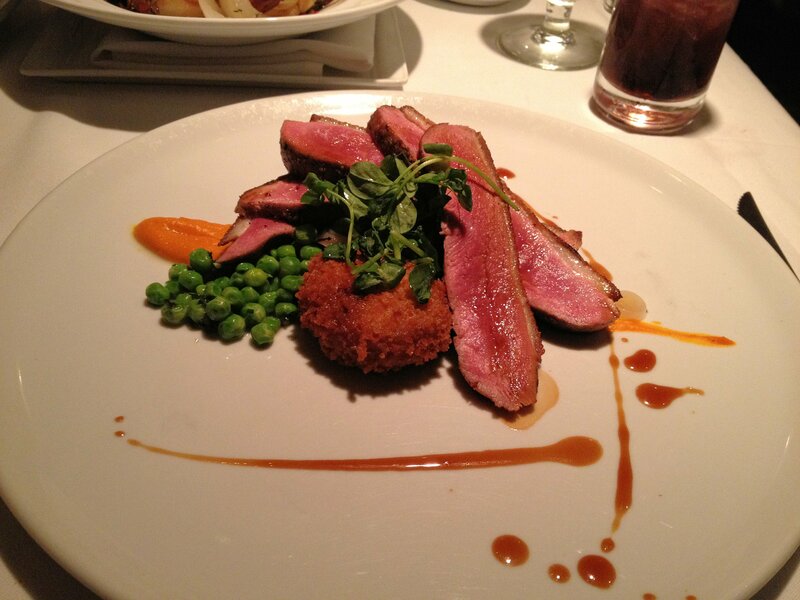 The duck breast was cooked perfectly…the restaurant recommends medium-rare. The duck confit beignet was also tasty. This was a very well prepared duck dish that I’d repeat. 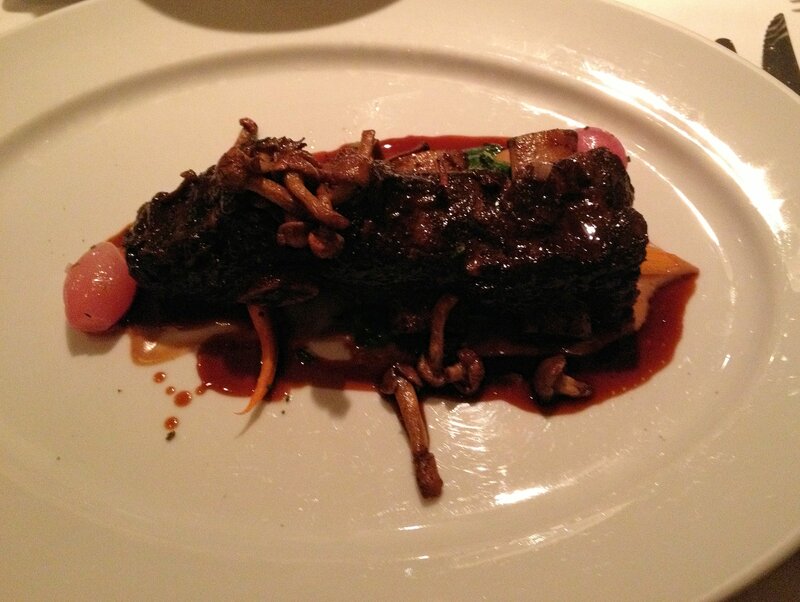 Braised Barbecue Bison Short Ribs – “Zola’s cornbread purée, heirloom carrots, turnip greens, chanterelles, barbecue spiced jus.” Although I loved the duck, I think this was the winner of the entrees. The smokiness hit my mouth before the fork made it to my mouth. Flavorful and perfectly cooked to fall off the bone…no knife needed. Vidalia’s Baked Onion – “Country ham, red-eye gastrique, mushrooms.” Being at a place called “Vidalia”, I couldn’t pass up getting this side dish. A hefty vidalia onion came out and was cut up by the waiter into petals of sweet liquid. 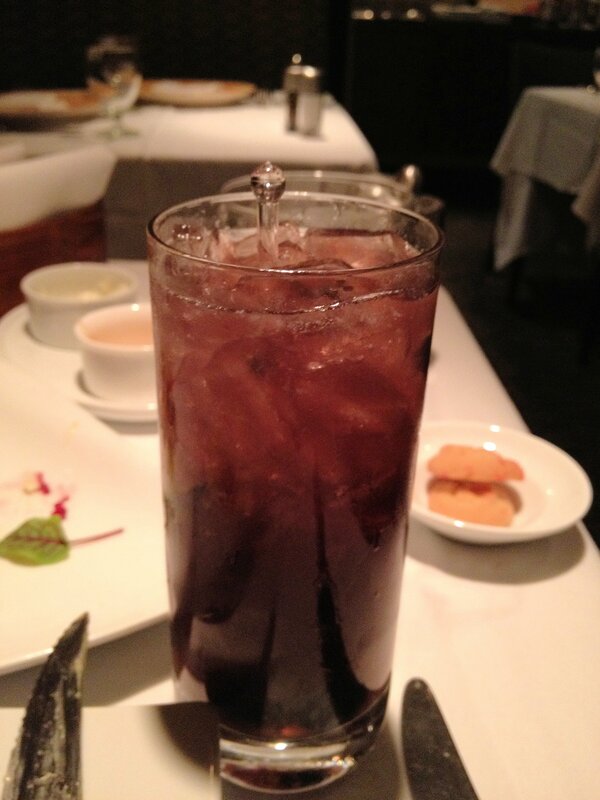 This was a good choice…it went well with the entrees and lived up to the restaurant’s name. The Vidalia Onion side dish…I don’t always eat all my side, but this time I did. 3-Cheese Plate – We went with a selection of cheese to start, one each from the sheep, goat, and cow varieties. Vidalia has an extensive cheese menu (~25 options) which changes often. The plating included three types of crackers and three jellies (apple, apricot, and plum) as accoutrements. 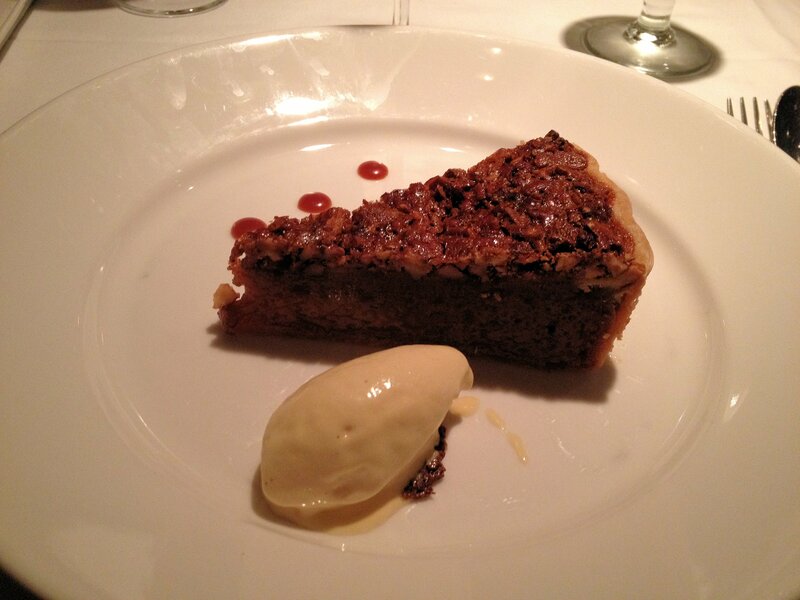 Georgia Pecan Pie – “Bourbon ice cream, praline lace crumble, caramel.” The server’s recommendation…good call. Paired well with the Boston Bual Madeira. Peanut Butter S’More – “Guanaja-peanut butter mousse, toasted marshmallow, graham cracker ice cream.” If you’re a peanut butter and chocolate fan, you need to get on this. Paired very well with the Pedro Ximenez Toro Abala Don. Tobacco Road – “Firefly Sweet Tea Vodka, Boyd & Blaire Vodka, Peychaud’s bitters, Cheerwine.” Another offering that includes the Cheerwine. Sweet, but not overly so. You definitely get that cherry pie flavor. 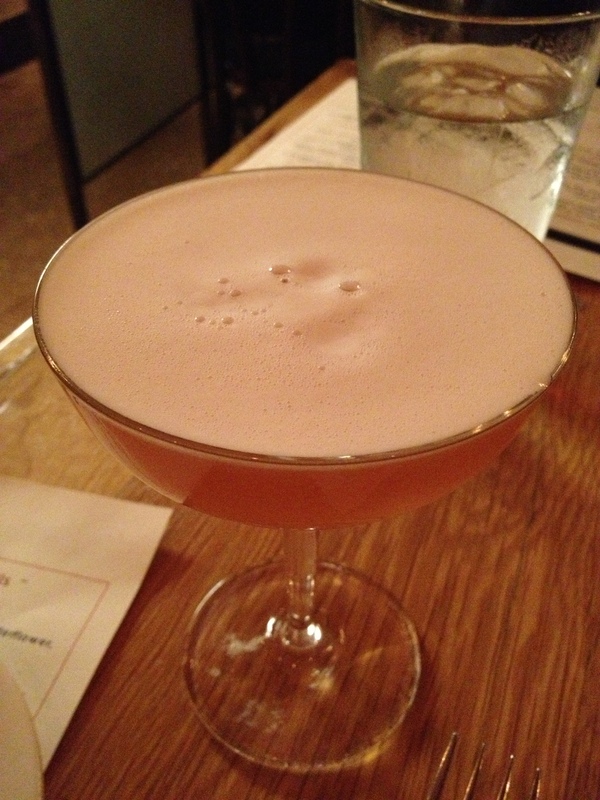 Wisteria – “Bluecoat Gin, crème de violette, cassis, soda, amaretti.” Tasted flowery and was purplish, hence the name. Good mix. Ben Baker – “Rittenhouse Rye, lemon, sugar.” Good one…if you’re looking for one a little less sweet than the above, this is a solid choice. Mint Julep – “Wild Turkey, sugar, muddled mint.” Tasty mint julep in a julep cup…it’s a southern restaurant, so it’s a good fit. 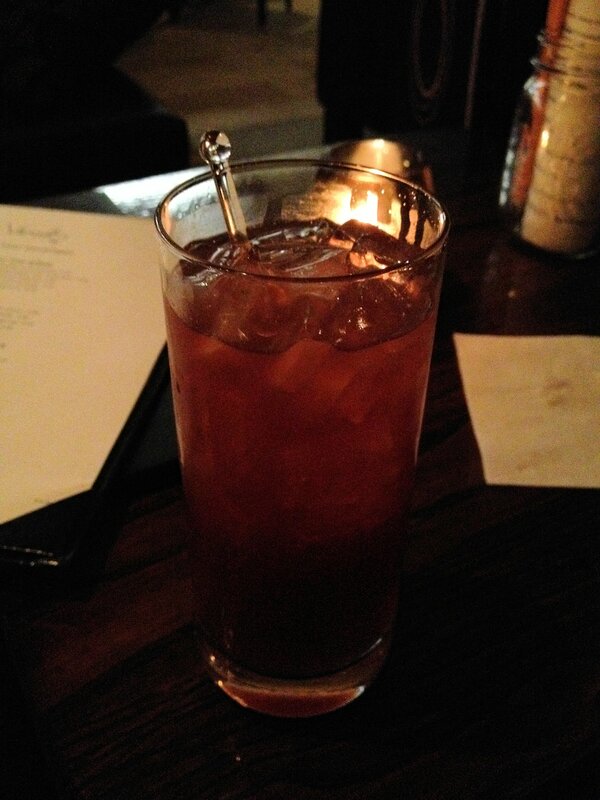 The Tobacco Road…it’s tough to tell but it’s slightly red…sort of looks like a Roy Rogers. The Wisteria…I know it looks like the one above, but this one was more of a purple than a red, thanks to the crème de violette. My high expectations for this dinner were met and exceeded. If you haven’t been, I’d recommend you change that. Buben has a second restaurant in DC, Bistro Bis, which serves French cuisine. That one is on my list.